Tom Goldman Tom Goldman is NPR's sports correspondent. His reports can be heard throughout NPR's news programming, including Morning Edition and All Things Considered, and on NPR.org. January 30, 2013  The Los Angeles Lakers are trying to turn around what has become a nightmare NBA season. A team with so many expectations may struggle to make the playoffs. They begin a seven-game road trip Wednesday. January 25, 2013  The Los Angeles Dodgers and Time-Warner Cable are expected to announce a deal that would give the team its own channel. The cable giant would handle distribution and operations. The Dodgers channel would pay the team roughly $7 billion over at least 20 years. January 18, 2013  In an interview with Oprah Winfrey, Lance Armstrong said he blood doped or used banned substances in all of his seven Tour de France victories. He also said he didn't believe it was possible to win seven titles without using drugs "in that culture." January 15, 2013  Tom Goldman talks to Audie Cornish about the latest reports on Lance Armstrong and a possible confession about his drug use during cycling championships. January 11, 2013  The new policies are being hailed as unprecedented in American professional sports. Starting next year, the league will be fighting the use of human growth hormone and testosterone, two allegedly popular banned substances. January 10, 2013  The Baseball Hall of Fame's Class of 2013 will not have any new inductees from the ranks of the recently retired. That's despite a list of candidates that includes Roger Clemens and Barry Bonds. January 8, 2013  Alabama won its second consecutive BCS title Monday night. The Crimson Tide beat No. 1 Notre Dame 42-14. January 7, 2013  Tom Goldman talks to Melissa Block about the college football championship game in Miami. Undefeated Notre Dame battles No. 2 Alabama for the Bowl Championship Series title. January 7, 2013  Alabama is trying to win its third title in four years Monday night. Notre Dame is trying to cap an undefeated season with a championship win. January 2, 2013  Pennsylvania's governor says he is suing the National Collegiate Athletics Association in federal court over harsh sanctions imposed on Penn State. Those sanctions followed a child sexual abuse scandal involving Jerry Sandusky, an ex-assistant football coach. The penalties included millions in fines, a four-year bowl ban and the forfeiture of 112 wins by its football team and were signed off on by the university. But Gov. Tom Corbett says the penalties are unfair and filed an anti-trust suit. December 27, 2012  There was plenty to celebrate — think summer Olympics. And plenty to deplore — bicycling steroid rings and yet another NHL lockout. 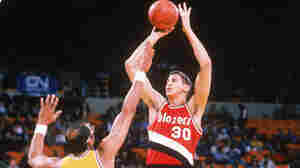 December 20, 2012  The Trail Blazers chose Kentucky center Sam Bowie with the second pick in the 1984 NBA draft. Then the Chicago Bulls took Michael Jordan. Bowie's tenure in Portland was marred by leg injuries; Jordan became a legend. ESPN recounts it all in a documentary about Bowie on Thursday night. December 10, 2012  For a second straight week, the world of football is coping with sad news. Two Dallas Cowboys players were involved in a one-car accident. One of the players was killed; the driver was arrested for drunk driving. This comes on the heels of last week's murder-suicide involving a member of the Kansas City Chiefs. December 5, 2012  The two sides in the National Hockey League labor dispute plan to meet again Wednesday, following an estimated 10 hours of talks Tuesday. It's day 81 of the owner lockout of players. Games are canceled through Dec. 14. The time is approaching when no deal will mean cancelling the entire season. December 3, 2012  College football's title game is set. All football fans have to do now is endure the interminable wait until Jan. 7 when No. 1 ranked Notre Dame plays No. 2 Alabama for the BCS Championship. The final BCS rankings were released Sunday night.